Is the First Five-Second Motorcycle Finished? Has Top Fuel dragbike legend Larry “Spiderman” McBride’s iconic, world record-holding motorcycle made its final pass down the quarter-mile? McBride plans to retire his legendary race bike when his longer and more modern motorcycle debuts in 2012. The new machine will be over a foot longer than McBride’s existing ride, at 18.8 feet. However, the ten-time champion says he won’t rush the new bike out. 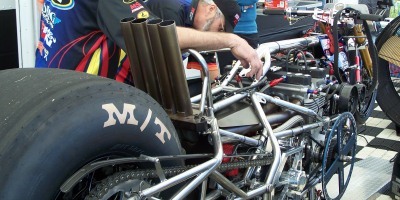 McBride’s current motorcycle was the first to break into the five second zone in 1999 at an NHRA national event at Houston Raceway Park. McBride first started competing on the legendary machine in 1994, and with it, recorded the current world record at 5.79. The motorcycle has been as quick as 5.74 unofficially. “My old bike means a lot to me. Eventually it will end up in a museum or in the front of my shop,” McBride said. In the meantime McBride is happy to report that longtime sponsors Pingel, Red Line Oil, Trim-Tex Drywall Products and Drag Specialties have already committed to supporting the world’s quickest motorcycle drag racer in 2012. For more visit the Pingel website and the Trim-Tex website. Cant wait to see it Larry, I’ll be looking out for you next year. Larry is the best top fuel pilot in the world..